Teen Drag Queens Will Steal Your Heart In 'Death Prefers Blondes' Caleb Roehrig's new YA thriller follows socialite-turned-cat burglar Margo Manning and her crew of kickboxing drag queens as they take on one last multimillion-dollar heist — and its consequences. The library is open, and it's time to read Caleb Roehrig's new YA thriller, Death Prefers Blondes. Margo Manning is a wealthy teen socialite by day and a badass thief by night. Whether it's rococo paintings at the Los Angeles Museum of Fine Art or the czarist diamond collection of a Russian mobster, no target is safe from Margo and her expert team of cat burglars. In addition to being very good at what they do, her crew has the benefit of knowing they're the most fabulous thieves in the business — quite literally, because they pull off all their heists in drag! Why would teen drag queens and a tabloid star choose a dangerous life of crime? For Margo, it's mostly about being truly excellent at something outside of the view of her overbearing father. But for the queens, it's life or death. Brothers Axel and Joaquin have a father in prison, a sick mother, and a sea of debt. Leif's homophobic parents no longer want to help him pay for the dance school that is his ticket to freedom, and Davon is desperate to get his addict drag mother away from their bad neighborhood and into rehab. When a multi-million dollar heist comes their way, it seems like too good an opportunity to pass up. It could be the last job — the one that allows them all to close this chapter of their lives for good. But it turns out that this particular robbery has consequences they can't shake. As one thing snowballs into the next, it becomes clear that the future of Margo's family legacy is at stake — along with her life and the lives of everyone she loves. In order to protect them, she'll have to orchestrate their biggest heist yet, stretching everyone's abilities to the limit and risking everything they all hold dear. If there's one thing this genre requires, it's a competent posse of deeply damaged human beings who are great at really specialized skills and terrible at life. Margo's team certainly fits the bill, and whether they're boosting cars, hiding in tight spaces, or kickboxing with the enemy, it's satisfying to see them take on the best laid security plans of the one percent. Likewise, the trials and tribulations the queens face in their daily lives feel believable and heartbreaking. It's a little harder to open up to Margo. She often comes across as the privileged rich kid that she is, and sometimes, early in the book, her motivations and woes feel a little petty alongside those of her team. What's more, we've seen characters like her before in YA, so caring about her as much as the others required a bit of effort on my part as a reader. It's also a little hard to come to terms with the morality of her entangling the queens in what for her is — at least at the start — a lark. They need the money, and are desperate enough to do whatever it takes. She doesn't, and to use a drag term, it feels a bit shady. She's taking advantage of them in order to have the team she needs to do what she wants. They get something out of it, but she's wealthy enough that she could also help them out of their difficulties though more legitimate, less dangerous means. There are moments where the book almost confronts this, but ultimately it's brushed aside to make room for the plot, making it even more difficult for me to get behind Margo as a protagonist. 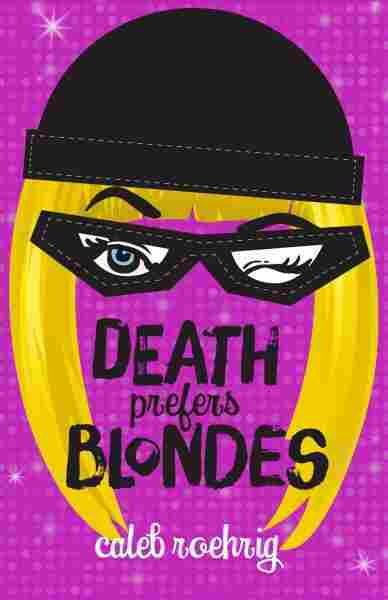 'Death Prefers Blondes' delivers on its promise of a glitzy teen thriller, and I was feeling the fantasy. To be honest, I came here for the drag queens anyway. The best parts of the book are the windows into their lives as we get everyone's point of view interspersed in the narrative. Axel ponders the fact that drag makes him feel invincible, and it's a fascinating idea that an art which can provide emotional protection might also be used as a more literal armor and disguise in an action sequence. Rarely do I find myself wishing for a bit less of the female character and more of the boys, but that was the case here. More time in the minds of Axel and Devon (the two who regularly perform in drag outside of their heists) could have deepened this metaphor. The book is juggling a lot, and the heists turn on a dime — enjoyable to follow, tense, exciting — it's a fun ride and the plot zips along, pushing the stakes ever higher and revelling in all the glamor and danger of Margo's double life and the general fabulousness of the queens. Death Prefers Blondes delivers on its promise of a glitzy teen thriller, and I was feeling the fantasy. Caitlyn Paxson is a writer and performer. She is a regular reviewer for NPR Books and Quill & Quire.